If you love dogs, you MUST watch a movie called Hachi: A Dog’s Tale. 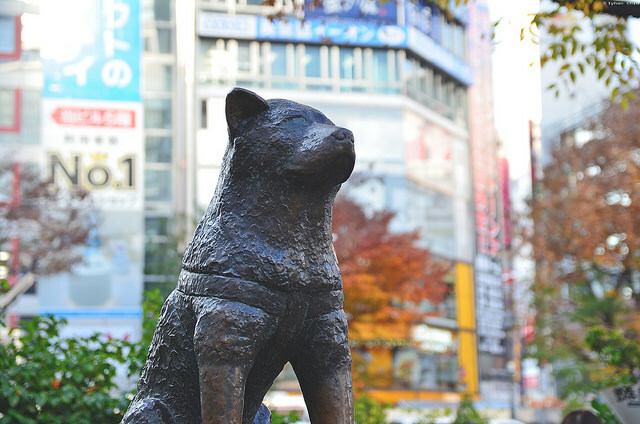 This American movie is based on the true story of an ultimate friendship and loyalty between an Akita inu named Hachi-ko (ハチ公), and his loving owner 上野英三郎 (Ueno Eisaburo). This is the remake of the original Hachi-ko movie made in 1987 in Japan, and Richard Gere plays the role of the owner, who is a university professor. I do not want to ruin it for those of you who have never heard of the story, so I am not going into the details. But please let me tell you that it is one of my all-time favorite movies because it reminds me of my dog, my best friend, who passed away a year ago. The story is actually quite painful, but is also extremely beautiful at the same time, as it keeps reminding me of the unconditional love my dog showed me. In the movie, there is a scene where Richard Gere asks his Japanese colleague what does 八 (hachi) mean. He explains, “Hachi, it’s Japanese for eight. It’s a number of good fortune.” The shape of 八 is known as 末広がり(sue hirogari) or “an upside-down fan shape”, I would say, which symbolizes the gradual growth and prosperity: the shape starts out narrow on top and broadens at the end. That is why business owners particularly prefer using number 8 for advertising and marketing purposes, whishing for a gradual and steady growth. 八 has also been used to express large numbers in Japanese culture. For instance, 八百万神 (Yaoyorozu no kami) means “millions and millions of gods” even though its literal translation is “eight hundred gods.” Similarly, 八重桜 (Yae Sakura or eightfold Sakura) indicates the type of cherry blossom with multiple layers of petals, and 八雲 (Yakumo or eight clouds) simply means many clouds. By the way, my friend once told me that the puppy they used in the film was not an Akita inu, but Shiba inu. Apparently finding an Akita puppy was extremely difficult in the U.S, so they substituted it with Shiba. I couldn’t tell the difference at all, but he sure was awfully cute!